This lion coloring page makes a wonderful activity for those love gorgeous animals. Lions are regal animals that have the colors of the sun, so use your favorite warm colors to create a lion of your own! And if you love other big cats, check out this cheetah coloring page as well! I hope you enjoy coloring this lion! 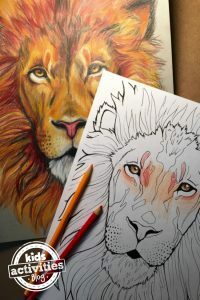 The post Lion Coloring Pages for Kids appeared first on Kids Activities Blog.